Online sellers should keep a few important things in mind. The convenience of gift cards will be a big draw for many Americans this holiday season, and shoppers will spend big on these cards as they work to cross loved ones off their shopping lists. Americans are expected to spend a total of $24.78 billion on gift cards this holiday season, with 77 percent of shoppers expected to buy at least one gift card this winter. On average, buyers will shell out $145.61 on gift cards, spending $41.48 per card, about a $2-per-card increase compared to last year, reports the National Retail Federation. "Gift cards serve as a blank check of sorts, giving gift recipients freewill to buy something they may have had their eye on for years," says Phil Rist, executive vice president of Strategic Incentives for BIGresearch. "For some, gift cards are straight from the heart and among the most thoughtful gifts that a person can receive." Department store gift cards will be the top choice for those who select the "virtual cash." 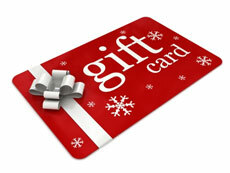 In fact, about 39 percent of gift card buyers say they'll opt for cards to department stores. Gift cards to restaurants will come in second with 33.4 percent of purchases, bookstores will be third with 23.7 percent and electronics stores will be fourth with 19 percent, according to the NRF. The popularity of these items is nothing new, the organization notes. Gift cards have been popular gifts for years, and have come in as the top item on people's wish lists since 1996. The news comes as no surprise to Auctiva Product Analyst and Top-rated seller Rebecca Miller. She has offered several gift cards on eBay, and she's seen firsthand just how popular they are. "It's basically like selling cash," she says. And they're an easy item to "regift"—if that's your bag. "A lot of times you end up with gift cards for stores that don't appeal to you, but you can find someone who will get some good use out of them on eBay. It's a win-win for both the buyer and the seller!" However, there are some things sellers should keep in mind if they decide to offer gift cards online. For instance, Miller notes that some gift cards lose value after a certain amount of time, so sellers should double-check the cards they have before putting them up for sale. "Be careful," she advises. "Make sure the gift card's value hasn't been reduced, because if it has, you will have to state that to your buyer. And you'll want to provide proof of the value of a card." One way to do this is to have the issuing store scan the gift card and provide you with a printout. This will show the date of the card and verify the value. Sellers should include this printout with their shipments. It's also a good idea to keep a record of the PIN on the card, in case it's lost en route to a buyer. "I jot down the card number and keep it until I know my shopper has received the card," Miller says. "That way if it goes missing, you can contact the store and cancel the card, or if a shopper is trying to scam you, they won't be able to use it either. Another win, win." Daily spending surpasses $1B for the first time. Regardless of type, women say personalization is important. Experts say there's still more heavy spending to come. Ask Auctiva: Will Buyers Come to eBay? Survey finds overall holiday sales expected to surpass last year's total.